Windows Vista TCP/IP (tcpip.sys) and UAC Auto Patcher is a simple batch command script that automatically replaces and overwrites original tcpip.sys in \Windows\System32\Drivers\ folder with a patched tcpip.sys version (included) that has been modified and cracked to unlock and remove the limit imposed on concurrent half open TCP/IP connection attempts that Vista can launch at any one time. Patching the tcpip.sys to remove the restriction potentially yields benefits or solves problems as below. Event ID 4226 in Event Viewer that describes TCP/IP has reached the security limit imposed on the number of concurrent TCP connect attempts (more info). Slow browsing speed such as web page unable to load or refresh when using P2P applications such as BitTorrent (BT) clients and eD2K eMule client. Microsoft has released plenty of versions of tcpip.sys, thus each different versions of Windows Vista TCP/IP and UAC Auto Patcher will work only on certain version of Windows Vista, depending on the variant of tcpip.sys installed. To check the version of tcpip.sys, navigate to \Windows\System32\drivers folder, right click on tcpip.sys and select “Properties”, and the version info will be listed in “Details” pane. Automatically copy and replace tcpip.sys with patched version that unlock TCP/IP connection limit. Set the maximum concurrent half-open TCP connection attempts to 50,000. Disable Windows TCP Auto Tuning feature to minimize possible networking problems. For Vista RTM with tcpip.sys version 6.0.6000.16567, applicable after installing KB941644. (Support x86/32-bit and x64/64-bit editions). For Vista RTM with tcpip.sys version 6.0.6000.20689, applicable after installing KB941644. (Support x86/32-bit and x64/64-bit editions). User has problem applying the patch or EventID 4226 still appearing can try to use Windows Vista SP1 64-bit (x64) tcpip.sys version 6001.18000 Auto Patcher. Unpack and extract the content of the archive, and then run InstallPatch32.bat (for x86 system) or InstallPatch64.bat (for x64 system). Administrator rights elevation required. 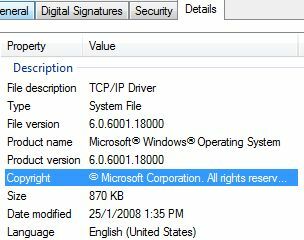 Windows Vista now require all kernel-mode driver or software to be signed with digital signature in 64-bit Windows, and all boot-start drivers must be embedded-sign with signature on both x86 and x64 versions of Windows Vista. Unfortunately, tcpip.sys is both kernel mode driver, and also boot start driver, and modify tcpip.sys will break the existing signature, making the patched tcpip.sys unsigned. So when using patched tcpip.sys, users must press F8 at every Windows boot load. When come to Windows’ Advanced Boot Options menu, select “Disable Driver Signature Enforcement” to bypass driver signing check and continue loading Windows Vista, else there may be boot-failure. The process can be automated with ReadyDriverPlus. Run UndoPatch.bat to restore original tcpip.sys (provided you don’t delete the backup tcpip.sys.original), uninstall and remove concurrent half-open TCP/IP connection limit setting in the registry, revert TCP/IP autotuning level to normal, and re-enable UAC. How to change the connection limit to other value? Locate “TcpNumConnections” registry value and change its value data to number you want. I don’t want to disable UAC, how to re-enable UAC? Run “Enable_UAC_Prompt.reg”, if you no longer want to patch tcpip.sys, run “UndoPatch.bat”. It’s also possible to use tool such as TweakUAC. 1. Insert your Windows installation CD & restart. Long answer makes short is press “Enter”, or pressing F8 while system starts up, which will display Vista Advanced Boot Options startup menu. Then select to “Disable Driver Signature Enforcement”. See explanation above on usage instruction, or use ReadyDriver Plus to permanently automate disabling of driver signature enforcement. Else, try out CrackTcpip.sys driver based limit bypass, or make use of fully automated Half-Open Limit Fix which makes used of test cert. Can I manually install the patched tcpip.sys manually? Yes. Checkout the manual installation guide. – Update patched tcpip.sys for 32-bit and 64-bit Windows Vista SP1 to build version v6001.18063 and v6001.22167 after installing KB952709. – Syntax bug fixes in installation script. – Include patched tcpip.sys driver for 64bit Windows Vista SP1 driver build v18000. – Introduce optional installation of ReadyDriverPlus v1.1 Driver to auto-press F8 and disable force driver signing at boot. – Update patched tcpip.sys build version to 32-bit (x86) SP1 RTM (v6001.18000 aka RC Refresh 2, which is also same and should work on RC Refresh v.744), contributed by Brian. – Remove command to disable driver signature signing integrity check (bcdedit /set loadoptions DDISABLE_INTEGRITY_CHECKS) for all x64 versions as no longer supported by Vista. – Change patcher name to Windows Vista TCP/IP and UAC Auto Patcher for all versions. – Update patched tcpip.sys build version to version 6000.16627 after installing KB946456, contributed by Brian. – Update patched tcpip.sys build version to version 6000.20752 after installing KB946456, contributed by Brian. – Update patched 32bit and 64bit tcpip.sys to version 6000.20689 after installing KB941644, contributed by Brian. – Update patched 32bit and 64bit tcpip.sys to version 6000.16567 after installing KB941644, contributed by Brian. – Update for patched 32-bit tcpip.sys to version 6000.20645 after installing KB940646, contributed by vano_spd. – Update patched 32-bit tcpip.sys to Vista SP1 Beta version, contributed by Daniel Carvalho Liedke. – Fix minor bug in uninstall script. – Fix TCP/IP re-enable Auto Tuning flag. – Support non C drive Windows Vista installation. – Allow user to terminate the install script even after running the auto patcher (confirmation needed before applying). – No longer ask user to enter Y to run one command. – Original tcpip.sys driver has been backup copy as tcpip.original in case in need to restore. – UndoPatch.bat added to automate uninstallation of patch.